From the Department of Human Genetics (J.L.W., Y.P., M.H.M. ), University of Michigan, Ann Arbor; Department of Anesthesiology (B.S.B., M.O., M.K.P.) and Neuroscience Graduate Program (B.S.B., M.K.P. ), University of Virginia, Charlottesville; Department of Medicine (A.V. ), Veterans Affairs Medical Center (A.V. ), and Department of Pediatrics (P.V. ), Duke University, Durham, NC; and Department of Medical Genetics (M.E.M.S. ), University Medical Centre Utrecht, the Netherlands. Objective: To determine the functional effect of SCN8A missense mutations in 2 children with intellectual disability and developmental delay but no seizures. Methods: Genomic DNA was analyzed by next-generation sequencing. SCN8A variants were introduced into the Nav1.6 complementary DNA by site-directed mutagenesis. Channel activity was measured electrophysiologically in transfected ND7/23 cells. The stability of the mutant channels was assessed by Western blot. Results: Both children were heterozygous for novel missense variants that altered conserved residues in transmembrane segments of Nav1.6, p.Gly964Arg in D2S6 and p.Glu1218Lys in D3S1. Both altered amino acids are evolutionarily conserved in vertebrate and invertebrate channels and are predicted to be deleterious. Neither was observed in the general population. Both variants completely prevented the generation of sodium currents in transfected cells. The abundance of Nav1.6 protein was reduced by the Glu1218Lys substitution. Conclusions: Haploinsufficiency of SCN8A is associated with cognitive impairment. These observations extend the phenotypic spectrum of SCN8A mutations beyond their established role in epileptic encephalopathy (OMIM#614558) and other seizure disorders. SCN8A should be considered as a candidate gene for intellectual disability, regardless of seizure status. Whole-exome sequencing has revealed a major role for de novo mutations in the etiology of sporadic intellectual disability.1 Between one-third and one-half of sporadic cases may be accounted for by de novo mutations in genes required for neuronal development and synaptic transmission. The neuronal sodium channel SCN8A (Nav1.6) is concentrated at the axon initial segment and at nodes of Ranvier of myelinated axons.2 Exome analysis for SCN8A mutations has thus far focused on children with seizure disorders.3 More than 150 missense mutations of SCN8A have been identified, and gain-of-function hyperactivity is the most common pathogenic mechanism for seizures. By contrast, we previously described a loss-of-function, protein truncation allele of SCN8A that cosegregated with cognitive impairment in a family without seizures.4 To follow up on that observation, we have now examined the functional effects of 2 SCN8A missense mutations identified by exome sequencing in children with intellectual disability who also did not have seizures. 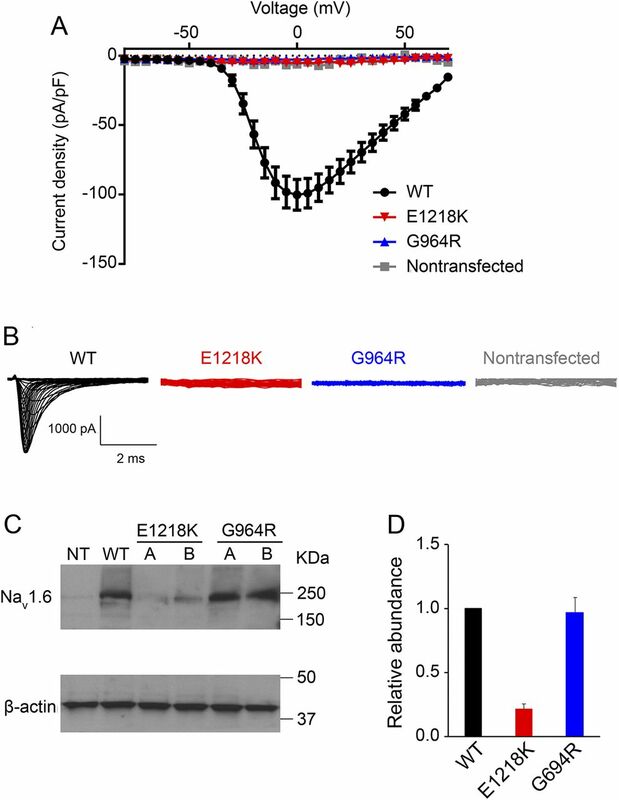 Both mutations caused complete loss of channel activity, confirming the role of loss-of-function mutations of SCN8A as a cause of isolated cognitive impairment. Exome sequencing for patient 1 was performed by GeneDX (Gaithersburg, MD). In addition to the SCN8A variant, a frameshift mutation in GJB2 (c.167delT, p.L56RfsX26) was inherited from an unaffected parent. Exome sequencing for patient 2 was performed at the laboratory for DNA Diagnostics in the University Medical Center Utrecht. In addition to the SCN8A variant, the PDHA1 variant (c.520G>A, p.Ala174Thr) was present in the child and an unaffected grandfather. Analysis of copy number variation and Fragile X expansion for patient 2 were negative. Procedures were approved by the institutional ethics standard committees. Written consent for research was obtained from the guardians of both patients whose variants were studied. Site-directed mutagenesis of Nav1.6 complementary DNA. Mutations were introduced into the tetrodotoxin-resistant mouse complementary DNA (cDNA) Nav1.6R by site-directed mutagenesis with QuikChange II XL (Agilent Technologies, Santa Clara, CA) as described.5 Two independent mutagenesis experiments generated cDNA clones A and B for each mutation. The 6-kb open reading frame was resequenced, and clones lacking other mutations were analyzed. Human embryonic kidney (HEK) 293 cells were cultured at 37°C, transfected with Nav1.6 cDNA, and lysates were prepared and analyzed 24 hours after transfection as described5 using affinity-purified polyclonal rabbit anti-Scn8a antibody (Millipore # AB5580, lot 2784259, 1:500 dilution). 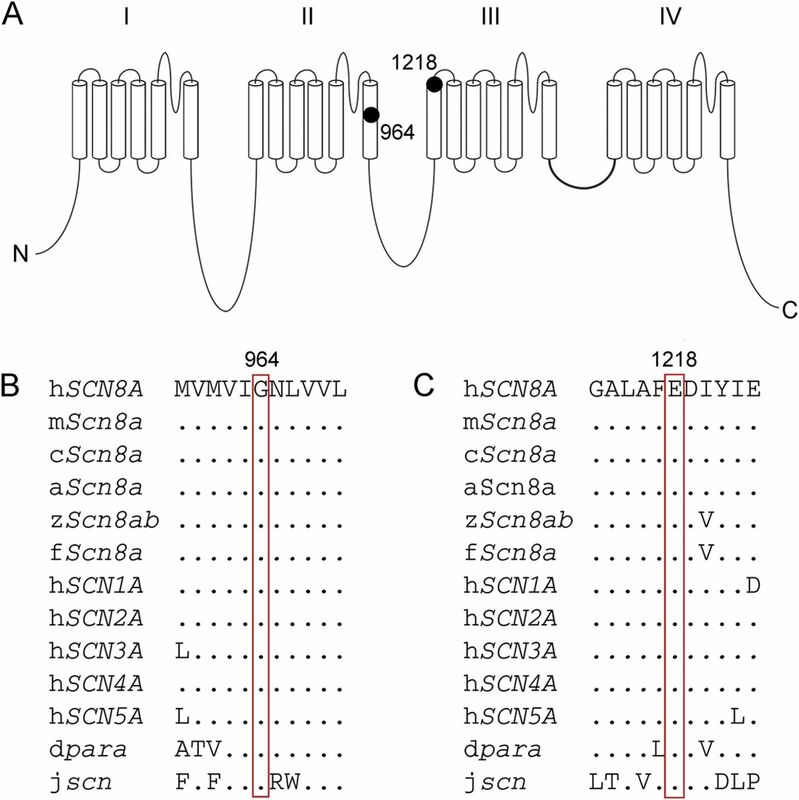 Identification of novel missense variants of SCN8A. Patient 1 is a 7-year-old girl who experienced global developmental delay and hypotonia in early childhood. She walked and spoke her first words at 18 months. She is receiving special education services at school and is repeating the first grade due to below average academic attainment. Psychoeducational testing revealed receptive-expressive language disorder and borderline intellectual functioning with a diagnosis of social communication disorder. She did not meet criteria for autism spectrum disorder. Attention-deficit hyperactivity disorder was diagnosed at 6 years and has responded to methylphenidate. Exome sequencing revealed the SCN8A variant c.2890G>C (p.Gly964Arg; G964R) which arose de novo and was not present in either parent. Gly 964 is located in transmembrane segment 6 of domain II (D2S6) and is highly conserved through invertebrate and vertebrate evolution (figure 1, A and C). Patient 2 is a 10-year-old boy who was born after a pregnancy complicated by polyhydramnios. Development was delayed from birth. Early ataxic gait resolved with age. Behavioral problems included temper tantrums. Metabolism and brain MRI were normal. There were no dysmorphic features. Exome sequencing and analysis of 770 genes identified the SCN8A variant c. 3652G>A (p.Glu1218Lys; E1218K) located at the distal terminus of transmembrane segment 1 in domain III (D3S1). This residue is highly conserved through evolution (figure 1, A and B). The variant was not present in the maternal genome; the father was not available for testing. Additional clinical features are detailed in the table. Both mutations were predicted to be deleterious by in silico prediction programs. Neither mutation was previously observed in patients or in the Exome Aggregation Consortium Database. Electrophysiologic characterization of SCN8A mutations G964R and E1218K. ND7/23 cells were transfected with wild-type or mutant cDNAs, and sodium currents were recorded (figure 2, A and B). The macroscopic Na current in nontransfected cells was −10.0 ± 1.8 pA/pF (n = 8). Cells transfected with wild-type Nav1.6 exhibited a robust macroscopic Na current of −102 ± 12 pA/pF (mean ± SEM) (n = 30). The current in cells transfected with mutant cDNA did not differ from nontransfected cells: G964R, −5.2 ± 0.5 pA/pF (n = 30) and E1218K, −9.8 ± 1.5 pA/pF (n = 27). To confirm the loss of activity, site-directed mutagenesis was repeated and a second independent clone with each mutation was analyzed, with the same result. Both missense variants thus result in a complete loss of channel activity. To evaluate the mechanism for loss of channel activity, we examined protein abundance in transfected HEK cells. Wild-type Nav1.6 and G946R cDNAs generated a protein with the predicted molecular weight of 250 kDa, which was not present in nontransfected cells (figure 2C). However, repeated transfections of the E1218K mutant cDNA detected only a low level of protein (figure 2, C and D), indicating that this mutation reduces protein stability. The patients described exhibited developmental delay and cognitive impairment but no history of seizures. Each carried a pathogenic missense variant of SCN8A that altered a highly conserved amino acid residue in a transmembrane segment of the channel, resulting in loss of function. SCN8A is one of the most conserved genes in the mammalian genome, with an unusually low rate of coding variation.6 The low frequency of frameshift and nonsense mutations among 60,000 individual exomes was used to calculate the probability of 1.0 that SCN8A is intolerant to haploinsufficiency.7 The population data support our conclusion that haploinsufficiency of SCN8A is responsible for cognitive impairment in these patients. Impaired cognition in the patients is also consistent with the evidence that heterozygous loss-of-function mutations in mouse Nav1.6 also result in cognitive and behavioral deficits without spontaneous seizures. Impaired learning in water maze and eye-blink conditioning tests8,9 and elevated anxiety in the open-field test10 have been described. At the cellular level, complete inactivation of mouse Scn8a reduces repetitive firing, resurgent current and persistent current in cerebellar Purkinje cells, prefrontal cortical pyramidal cells, and hippocampal CA1 cells.2 These changes decrease the frequency of action potentials. Reduced neuronal activity is a likely consequence of the loss-of-function mutations of SCN2A and receptors involved in excitatory neurotransmission that have also been associated with intellectual disability. Chronic reduction of neuronal activity may alter the dynamics of synaptic plasticity during maturation and lead to aberrant cerebral circuitry and intellectual disability. In contrast to the loss-of-function variants described here, we previously identified 8 gain-of-function variants resulting in channel hyperactivity resulting in epileptic encephalopathy (reviewed in reference 3). We also found loss-of-function missense variants in 2 patients with seizures,11,12 indicating that genetic background influences clinical outcome. Both gain-of-function and loss-of-function variants of the related sodium channel SCN2A have also been associated with seizures.13 A recent analysis of de novo mutations in more than 7,000 individuals with developmental disorders identified 5 missense variants of SCN8A in patients with seizures and 2 missense variants of SCN8A in patients with cognitive impairment but no seizures.14 We would suggest that the former variants are likely to cause channel hyperactivity and the latter to cause loss of function. Protein truncation variants of SCN8A are underrepresented in all populations studied to date, including controls, patients with intellectual disability, and patients with seizures. It seems likely that these protein truncations are associated with distinct disorders not yet subjected to large-scale exome sequencing, such as neuromuscular and movement disorders. The de novo mutation of SCN8A in patient 1 is consistent with the growing recognition of the role of de novo mutations in sporadic intellectual disability. In 3 earlier studies examining 142 individuals with intellectual disability, 1 de novo missense mutation of SCN8A was detected.14,–,17 Better estimates of the quantitative contribution of SCN8A mutations to sporadic and inherited forms of isolated cognitive impairment will emerge from additional large-scale screening of patient populations. Jacy L. Wagnon provided molecular data and contributed to writing the manuscript. Bryan S. Barker provided electrophysiologic data and manuscript editing. Matteo Ottolini provided electrophysiologic data. Young Park provided molecular data. Alicia Volkheimer provided clinical information for patient 1. Purnima Valdez provided clinical information for patient 1. Marielle E.M. Swinkels provided clinical information for patient 2. Manoj K. Patel provided experimental data and edited the manuscript. Miriam H. Meisler initiated the study and drafted the manuscript. Supported by NIH (R01 NS 34509 [M.H.M.] and R01 NS 75157 [M.K.P.]). J.L. Wagnon has received research funding from the NIH and the Dravet Syndrome Foundation. B.S. Barker, M. Ottolini, Y. Park, A. Volkheimer, P. Valdez, M.E.M. Swinkels, and M.K. Patel report no disclosures. M.H. Meisler has served on scientific advisory boards for the Dravet Syndrome Foundation and the Cute Syndrome Foundation and has received research support from the NIH. Go to Neurology.org/ng for full disclosure forms. ↵* These authors contributed equally to this work as cofirst authors. ↵† These authors contributed equally to this work as colast authors. Accepted in final form May 11, 2017.
. Sodium channel SCN8A (Nav1.6): properties and de novo mutations in epileptic encephalopathy and intellectual disability. Front Genet 2013;4:213.
. SCN8A encephalopathy: research progress and prospects. Epilepsia 2016;57:1027–1035.
. Heterozygosity for a protein truncation mutation of sodium channel SCN8A in a patient with cerebellar atrophy, ataxia and mental retardation. J Med Genet 2006;43:527–530.
. Pathogenic mechanisms of recurrent epileptogenic mutations of SCN8A in epileptic encephalopathy. Ann Clin Transl Neurol 2015;3:114–123.
. Inactivation of sodium channel Scn8a (NaV 1.6) in Purkinje neurons impairs learning in Morris water maze and delay but not trace eyeblink classical conditioning. Behav Neurosci 2006;120:229–240.
. Exaggerated emotional behavior in mice heterozygous null for the sodium channel Scn8a (Nav1.6). Genes Brain Behav 2008;7:629–638.
. Impaired motor function in mice with cell-specific knockout of sodium channel Scn8a (NaV1.6) in cerebellar purkinje neurons and granule cells. J Neurophysiol 2006;96:785–793.
. Characterization of an SCN8A mutation in a patient with epileptic encephalopathy. Epilepsy Res 2014;108:1511–1521.
. De novo gain of function and loss of function mutations of SCN8A in patients with intellectual disabilities and epilepsies. J Med Genet 2015;52:330–337.
. Genetic and phenotypic heterogeneity suggest therapeutic implications in SCN2A-related disorders. Brain Epub 2017 Mar 4. Deciphering Developmental Disorders Study. Prevalence and architecture of de novo mutations in developmental disorders. Nature 2017;542:433–438.
. Range of genetic mutations associated with severe non-syndromic sporadic intellectual disability: an exome sequencing study. Lancet 2012;380:1674–1682.
. De novo mutations in moderate or severe intellectual disability. PLoS Genet 2014;10:e1004772.
. Genome sequencing identifies major causes of severe intellectual disability. Nature 2014;511:344–347.